Excellent creativity with those. I sure would like to add some big spinners to my arsenal. Wow, those are some "banging" spinners. Just like shooting fish in a barrel. I'd have no use for those giant lures, but damn if they aren't cool! I like these a lot! Nice job! I have a feeling that this will be my month! I even shared this on G+ for some good kharma! BTW...I am FINALLY going to put those steelhead spinners that I got form you a couple of months ago to use this evening. Awesome lures, bet they'd work on springers! NMFISHN from fishenchantment.com needs more of those! I've been catching Tigers with them all year! Mariposa from FE here- Matt took my spinner so I'd love to have this pair. Thanks for the contest! She can have one but NMFISHN from FE needs them more then her! 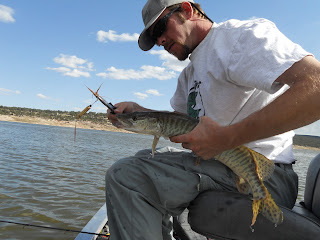 NMFISHN needs more FCS tackle!! NMFISHN from FE Signing off in hopes of winning! FCS ROCKS!!! @MARIPOSA - NMFISHN will just take these ones away too. LOL! They are safer with me. I know some Pike that would like to try and make a meal out of these. We see 308 spinners, Pike and Muskie see Mashed Potatoes and Gravy!! Wishing everyone good luck on this drawing as I secretly wish you not so good luck!!!! LOL! JK! Good luck everyone!! Nice spinners! Way to reduce reuse and recycle! I only have three comments?! WL Teal101 in for the contest! Killer looking spinner. Very original. Awesome post! I like it very much. I'll be reading again soon! I love the Muskie Blasters fishing lures! Think I still have an assortment for sale in webstore in the 'Other' category. The webstore has a new format, check it out. Still not finished reformatting, but pretty happy with it so far. Those are some really cool lookin spinners. The fact that you're going green by recycling the materials is just a bonus. What are you charging for those, if you still have any. Think they were like $10 each, not making them unless a customer wants some as a custom job with their brass and will mail it to me. Great post, the spinners looks great and I like recycled material in those.